On this day, the 28th of November, we commemorate the Holy Martyrs Timothy and Theodore the Bishops; Peter, John, Sergius, Theodore and Nikephoros the Priests; Basil and Thomas the Deacons; Hierotheos, Daniel, Chariton, Socrates, Komasios and Eusebius the Monks; with Etimasios, who all met their end by the sword. Were seen to be exceedingly honorable gifts to God. Afterwards they were observed becoming the sacrifices. The contestants stand nearby serving. Now they stand together with the six-winged intelligences. Stands your calling, for you have honor above. When by the permission of God the impious Julian the Apostate reigned, in the year 361, he displayed great madness and rage against the Christians. The villain used every design and every manner to make most of the Galileans, namely the Christians, to disappear from the world. This is what the defiled one called the Christians with insolence. Likewise, he was afraid to utter with his lips the divine and most glorious name of Christ. For he had been taught by his magician teachers, what great power was contained in this name, and how many of their diabolical deeds were thwarted. He therefore ordered the governors of all the cities to torture the Christians with as many punishments as they could. When the ruler of Nicaea learned about this order, he proclaimed to all the people of Nicaea, that all those who believed in the Crucified One, were to either deny their faith and sacrifice to the idols, or they will taste indescribable tortures. Many Christians heard this proclamation, and with one voice they all cried out: "We will not deny Christ the true God, and sacrifice to dumb and senseless idols. 'These gods, who did not make the heavens and the earth, will perish from the earth and from under the heavens'" (Jer. 10:11). Hence some of these were punished with various tortures and died, while others fled to the mountains and deserts, and others dispersed to various cities. Among these Christians were Saints Timothy, Komasios, Etimasios, Eusebius and Theodore. Unable to see the religion of the idols expand, they departed Nicaea and went to Thessaloniki. Seeing there also the citizens being obedient to the impious will of the Apostate, by elevating Hellenism, they withdrew from there and went to Tiberiopolis, which is known in Bulgaria as Strumica, just north of Thessaloniki, at the border of Illyria, namely Slavonia. Timothy would later become Bishop of Tiberiopolis. Komasios who was previously a soldier, became a monk, and preached the word of truth to the inhabitants of Tiberiopolis. Eusebius also became a monk, and also preached the Gospel of Christ. Theodore also became a Bishop, and was one of the three hundred and eighteen God-bearing Fathers who gathered together in Nicaea in 325 for the First Synod. He brought the light of Orthodoxy to the inhabitants of Strumica. When the conduct of these sacred men was learned, Peter, John, Sergius, Theodore and Nikephoros the Priests, with Basil and Thomas the Deacons, and Hierotheos, Daniel, Chariton and Socrates the Monks, went to meet the Saints in Strumica. For all who contemplate the law of the Lord always, are of one angelic conduct, illuminating the souls of men with the light of the knowledge of God, healing the passions of the soul as well as the body. As payment for this healing they ask of those who are ill to believe in Christ. When the sitting rulers of Thessaloniki, Valens and Philip, who were fervent observers of the orders of the impious emperor, heard of their fame, they went to Strumica, had the Saints apprehended, and made them stand before them. They therefore examined them, chiding: "Why do you despise the imperial orders, turn away from the testimonies of the gods, and worship a man who was crucified with thieves?" The Saints opened their mouths, making known to them the vanity of the idols, confessing the Mystery of pious Theology, and the economy of God the Word. The rulers cut off the words of the Saints, and said to them: "Either confess that you will sacrifice to the gods, or if not, you will be put to death." The Saints then with one voice cried out: "We will never sacrifice to the demons and these idols, for we were liberated from servitude to the demons by our true God!" Because the rulers sought to return to Thessaloniki, to attend to public matters, they decided to have all the Saints killed by the sword. Therefore as the brave contestants of Christ went to the place of their execution, they rejoiced with joy and exalted with unspeakable gladness. Thus they were beheaded, and they all received from the Lord unfading crowns of martyrdom. One of the sixteen Saints, the priest named Peter, being inflamed in his heart with divine zeal, cried out: "O apostates and enemies of truth, why do you guiltlessly spill the blood of the righteous, in whom there cannot be found anything worthy of death?" When the defiled rulers heard this, they ordered the Saint to be stripped naked, and spread out on the ground. Then they were to beat him with rods, cut off his hands, and then to behead him. When this took place, they cast away his sacred hands to be eaten by dogs. A woman who was blind from birth was standing there, and she understood that the right hand of the Martyr was thrown next to her foot. She therefore took it, and wrapping it in the scarf she wore on her head, she went home. Out of her joy, and not knowing what to do with such a treasure, she kissed the martyric right hand, embraced it, and placed it on her eyes. And immediately - O your wonders Lord! - her eyes were opened, and upon seeing the light of the sun, she proclaimed with a loud voice the power of Christ and the Saints. Then taking the right hand, she went to Thessaloniki, and had it treasured there in the Church of the victorious Saint Anastasia. Because the relics of the Holy Martyrs were cast away and remained unburied and unhonored, when the rulers returned to Thessaloniki, some Christians received permission, and took them with lamps and incense, and buried them with honors in Tiberiopolis, each relic in a separate coffin, and on each coffin was written the name of each Martyr as well their life and office. From that time forward, springs of miracles gushed forth from the holy relics, not only to the residents there, but even for those who lived far away, so that many Greeks, being moved by these miracles, believed in Christ and were baptized. Therefore there did not remain in either Strumica or its boundaries, any impious Greeks. By asceticism you killed the flesh, you preached the word of piety, you turned away from the earthly, and longed for Christ wise athletes, you resisted the tyrants brave-minded ones, and having been crowned with crowns of the contest, healings issue forth to those who approach you. 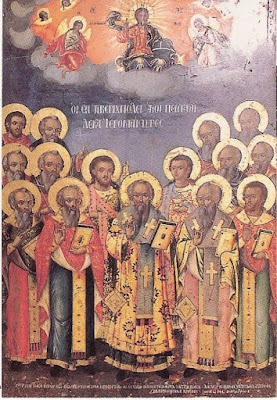 The fifteen athletes of Christ, the firm patrons of Tiberiopolis, Timothy and Theodore the renowned Hierarchs, Eusebius, Komasios and divine Socrates, together with their ten fellow athletes, as stars today they beam with rays of light, all manner of miracles. 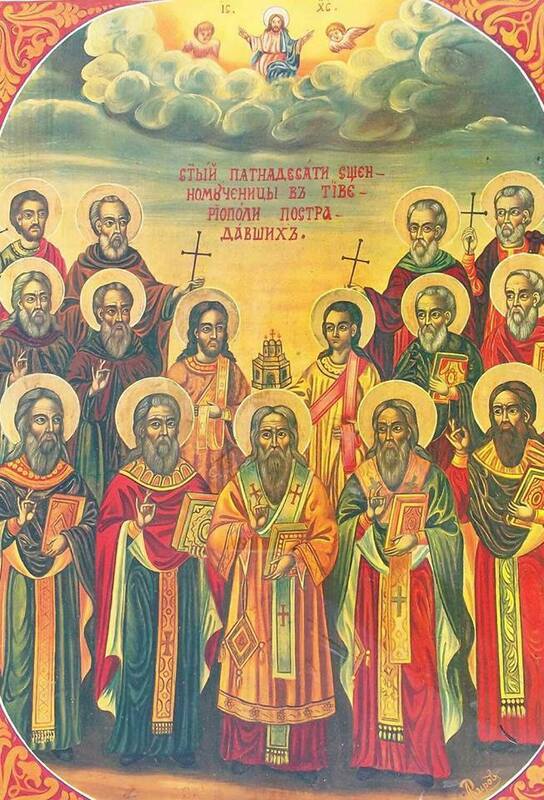 Hieromartyrs of Christ, the five and the ten, purified the impious, error of the idols, with that of the Apostate, and we glorify you with hymns of praise.